I discovered Julia Green’s ‘Blue Moon’ when I went to a secondhand book sale a few weeks back. The central theme of the book was appealing to me and so I thought I will get it. A couple of days back when I thought that I should pick a light novel which can be read quickly, I thought I will read Green’s book. Not exactly because the theme is light – because it is not – but because it is a YA book and so I thought the prose will be simple and the book will be plot-driven and so it will be a quick read. I read most of the book yesterday – yes, it was a quick read. Here is what I think. ‘Blue Moon’ is novel on teen pregnancy. Mia, the heroine of the story is fifteen. Her parents are divorced and she lives with her dad. Her eldest sister is on holiday and will be going to university soon while her middle sister has taken a gap year and is travelling to France and Italy. Mia likes a boy in school called Will and they start going out together. Then one day she discovers that she is pregnant. She doesn’t know whom to talk to, about it – she thinks her dad will get angry at her, Will will stop talking to her and nobody will listen to her point of view. Finally she confesses to her friend Becky and Becky is supportive of her. Mia is undecided on what to do – whether to have the baby, or have the baby and give it up for adoption or have an abortion. Then her dad gets to know Mia’s secret. And as Mia suspects, her dad gets angry at her. He says that she has to get an abortion and he fixes a time at the hospital. But on the day the surgery is expected to take place, Mia decides that she wants to have the baby and become a mother. She runs away from the hospital. After wandering around she ends up meeting two women who have their own boat. They give her shelter in the boat and are initially supportive of her. After a while, however, they say that she has to help them in their work in the boat. Then they start sailing to a new town. What adventures Mia has on the way and whether she has the baby and finds happiness in the end form the rest of the story. When I started reading ‘Blue Moon’, I was thinking of the movie ‘Juno’. I love ‘Juno’ and have watched it many times. But the central idea of the movie has now become very clichéd after getting repeated so many times in other movies and TV series – a teenage girl gets pregnant, her parents are supportive, her friends are nice to her, she has the baby and then gives it up for adoption and then returns to her former life at school – that I was hoping that ‘Blue Moon’ was not another story like that. Fortunately, it wasn’t. In this story, Mia’s dad is shocked and is angry at her. He takes him a while to understand things from her perspective. Mia feels lost as she doesn’t have anyone to talk to and confide her feelings with. When she is pushed to the extreme (atleast that is the way she seems to look at it) she runs away from home. All these are realistic scenes in the story which make ‘Blue Moon’ different from the typically hunky-dory teenage pregnancy novel. She imagined spitting the words out, bouncing them over the hard floor, translucent like marbles, each one with its coloured spiral trapped inside. She opened the back door to let the cat in and then stepped right out on to the wet grass. The cold stung her bare feet, but she liked the feeling : sharp, more alive. There was a shadow over the garden now. The day had lost its shine, its early morning promise. Water drops flew off its fur in a perfect circle of fine spray. She knocked the soap into the bath by mistake and it slipped like a fish in her hands as she tried to scoop it back up. Simple sentences which describe everyday scenes, but they are so beautiful aren’t they? It looked like Julia Green had spent time polishing these simple sentences with a lot of love and made them shine. I didn’t love the second part of the book as much, but I still liked it. It was interesting and Mia’s evolution as a person through the second part of the story was quite nicely told. Well, you can imagine what must have happened at the end of the story. The moon does turn blue. To find out in detail what that means, you should read this book. I discovered to my pleasant surprise that Julia Green has written a sequel to this book called ‘Baby Blue’. I hope to read that sometime. Have you read ‘Blue Moon’ or any other books by Julia Green? When I read Claire’s (from ‘Word by Word’) review of Diana Athill’s ‘Stet’, I made a mental note to look for that book and other books by Athill. Soon, I got a chance to stop by at a sale of secondhand books. Most of the books which were featured there were popular bestsellers. But as past experience has taught me that if I spend enough time at a sale like this, some treasures will pop out from unlikely places, I decided to look through the collection carefully. And, of course, the hidden treasures started popping out. One of them was Diana Athill’s ‘Somewhere Towards the End’. I was quite excited when I discovered it. I finished reading it yesterday. Here is what I think. Near the park which my bedroom overlooks there came to stay a family which owned a pack of pugs, five or six of them, active little dogs, none of them overweight as pugs so often are. I saw them recently on their morning walk, and they caused me a pang. I have always wanted a pug and now I can’t have one, because buying a puppy when you are too old to take it for walks is unfair. I was right in thinking that I will never see it being a tree, but I underestimated the pleasure of watching it being a fern. It was worth buying. In the in-between middle, Athill shares her thoughts on becoming old, on her past lovers and how her relationships with them changed with age, on taking care of old people, on having a family vs staying single, on how her writing picked up after she became old, on how she stopped reading fiction after getting old, on how old age has made her a stronger atheist, on the pleasures of gardening and driving cars, on having adopted daughters and grandchildren, on developing new interests and hobbies, on how some old people are lucky with their health (she includes herself in this) and on old age ailments and regrets. Each chapter is on a particular topic (though the chapters don’t have titles) and these are reasonably self-contained and so can be read independently. Reading the book felt like sitting at the feet of my grandma and listen to her tell stories. The only difference is that though Athill was born in 1917 and at 96 years old (89 years old when she wrote this book) is an Ancient (she calls herself that – so don’t get angry at me 🙂), her voice is fresh and quite contemporary. Her life as she has described it is quite fascinating – graduating from Oxford in the 1930s (must have been comparatively rare for a woman at that time), staying single and never marrying for her whole life (though she had lovers at different times), being financially independent and working till she was seventy five, not being too attached to money and not trying to accumulate material possessions (she says that she didn’t own a house at the time she wrote this book a few years back). I know there are younger women (and men) today who defy the norm and live independent lives pursuing their careers and their interests (it is still rare to find them though – most people seem to be living similar lives, doing the same things, having the same interests, watching the same movies, even having remarkably similar opinions on social and political issues – nothing wrong in that though, it is part of the fun of being a human being), but for someone who lived through most of the twentieth century, when things were conservative for a significant part of the century, I think it must have required a lot of bravery and courage and a fiercely independent spirit to do what she did and live life the way she did. (It is fascinating to compare Athill with a few other great literary women of the 20th century – Virginia Woolf was still alive and writing novels when Athill graduated from Oxford and went to work; Irish Murdoch was two years younger (yes, younger!) than Athill. Simone de Beauvoir was just nine years elder to Athill, so practically they were from the same generation but it doesn’t feel that way when we think about it now). There is only one place where where Athill betrays her great age and we feel that she was really born in a different era. It happens when she says this : “I depend so much on reading because I never developed the habit of watching television. I have never even bought a set.” It was absolutely unbelievable for me. It made me think of my father though – he never developed an interest in television other than watching the news. (My mother loved watching television, but mostly movies and movie-based programmes and not serials). I don’t think my grandparents ever watched television. Some of the things that Athill says make us want to have a debate with her. On her not wanting to have children, she says – “I have uncommonly little maternal instinct, a deficiency I think I was born with. As a child I was not just indifferent to dolls, I despised them.” It is, of course, a total contradiction to what she says in the first passage of the book – that she loves dogs and likes taking care of them and taking them for walks. I think at some level taking care of a puppy or a dog is as complex and as rewarding as taking care of a child. Also, having a dog is like having a child forever – it won’t grow up (it will grow up in a doggy sense, but not in a human sense), go to university, get a partner, find a job and move out of home. It is going to stay with one forever. And one has to take care of it forever. It is paradoxical that Athill loves that but doesn’t have a maternal instinct for children. Athill, of course, acknowledges what might be the real reason : “selfishness…which made me wary of anything to which one has to give one’s whole self, as a mother has to give herself to an infant and a toddler. It was that which prevented me from wanting a child for so long…” This and other honest, self-critical things that Athill says in the book made her more interesting and charming and made me like her even more. Another thing which Athill says which might lead to debate is about loyalty, especially in marriage. She starts on the topic with this sentence – “Loyalty is not a favourite virtue of mine.” She then continues with – “Loyalty unearned is simply the husk of a notion developed to benefit the bosses in a feudal system. When spouses are concerned, it seems to me that kindness and consideration should be the key words, not loyalty…” It is a point of view which will lead to some interesting conversation. This is a topic which will make for a fascinating conversation on a winter evening, in front of a warm fire, with a drink in hand. My love for the small quirky things sprang into full attention when I noticed the word ‘pernickety’ in the line – ‘old age has made me pernickety’. It sounded very similar to ‘persnickety’ and after a little bit of research I discovered that they mean the same thing – the former is the British spelling while the latter is American. It made me wonder how that extra ‘s’ came into the word in the American version. Doesn’t American spelling always remove redundancies and make it easier for one to spell the word (like ‘color’ instead of ‘colour’)? What is the story behind that ‘s’? Would you know? I totally loved Diana Athill’s ‘Somewhere Towards the End’. It is beautiful, charming, heartwarming and a pleasure to read. I loved this description of the book on the cover – “Jean Rhys said that literature was a lake, and what mattered was to contribute to it, even if only a trickle. She contributed a narrow boiling river. Diana Athill contributed a cool clear burn.” I would love to read all of her books now. I hope she lives to a great age, continues to drive her car, and continues to share her wisdom to readers through her writing. Getting one’s hands into the earth, spreading roots, making a plant comfortable – it is a totally absorbing occupation, like painting or writing, so that you become what you are doing and are given a wonderful release from consciousness of self. If this is smugness, and I can’t help feeling that it is, then I have to report that I have learnt through experience that, though repulsive to witness, it is a far more comfortable state to be in than its opposite. …most lives are a matter of ups and downs rather than of a conclusive plunge into an extreme, whether fortunate or unfortunate, and quite a lot of them seem to come to rest not far from where they started, as though the starting point provided a norm, always there to be returned to. What is so good about it is not just the affection young people inspire and how interesting their lives are to watch. They also, just by being there, provide a useful counteraction to a disagreeable element in an old person’s life. We tend to become convinced that everything is getting worse simply because within our own boundaries things are doing so. We are becoming less able to do things we would like to do, can hear less, see less, eat less, hurt more, our friends die, we know that we ourselves will soon be dead…It’s not surprising, perhaps, that we easily slide into a general pessimism about life, but it is very boring and it makes dreary last years even drearier. Whereas if, flitting in and out of our awareness, there are people who are beginning, to whom the years ahead are long and full of who knows what, it is a reminder – indeed it enables us actually to feel again – that we are not just dots at the end of thin black lines projecting into nothingness, but are parts of the broad, many-coloured river teeming with beginnings, ripenings, decayings, new beginnings – are still parts of it, and our dying will be part of it just as these children’s being young is, so while we still have the equipment to see this, let us not waste out time grizzling. 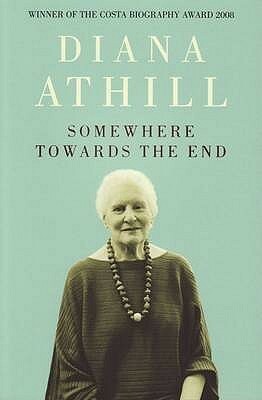 Have you read Diana Athill’s ‘Somewhere Towards the End’ or any other book by her? What do you think about them? The way we discover new books and writers is sometimes quite interesting and serendipitous. This is how I discovered Joanna Russ’ ‘We Who Are About To…’. I read Bettina’s (from Book, Bikes and Food) review of Ursula Le Guin’s ‘The Left Hand of Darkness’. In the comments section, Joachim Boaz had recommended Joanna Russ’ book (his review is here) and I went and read about the book and about Joanna Russ in Wikipedia and I was so fascinated that I couldn’t resist getting it. I finished reading it yesterday. Here is what I think. “if it’s tagged, that means it’s like Earth. And we know Earth. Most of us were born on it. So what’s there to be afraid of, hey? We’re just colonizing a little early, that’s all. You wouldn’t be afraid of Earth, would you? Oh, sure. Think of Earth. Kind old home. Think of the Arctic. Of Labrador. Of Southern India in June. Think of smallpox and plague and earthquakes and ringworm and pit vipers. Think of a nice case of poison ivy all over, including your eyes, Status asthmaticus. Amoebic dysentery. The Minnesota pioneers who tied a rope from the house to the barn in winter because you could lose your way in a blizzard and die three feet from the house. Think (while you’re at it) of tsunamis, liver fluke, the Asian brown bear. Kind old home. The sweetheart. The darling place. Think of Death Valley…in August. The first one hundred pages of the book describe our heroine’s interaction with her spaceship mates. The next seventy pages describe what happens when she gets ready to die. I found the central theme of ‘We Who Are About To…’ quite powerful and interesting. If we are not spiritual or religious, it could be our own story told in science fiction form – on how all effort is meaningless (except for making our life comfortable and happy when we are around) and the only inevitable thing is death. If we are religious or spiritual, of course, we will vehemently disagree with the story’s central idea, because according to us a better world awaits us after death. The book also describes what happens when a few people end up in a isolated situation cut-off from the world – on how normal rules don’t apply there, on how new rules are formed based on the power structure, on how women are taken care of but are also suppressed because of their ability to bear children. The book also explores the theme of freedom – whether we can really practise our freedom when what we want is at variance with what most others want, and the price we have to pay for practising this kind of freedom. In some ways, Russ’ book made me think of ‘We’ by John Dickinson which I read a few years back and which had a similar theme, but a different ending, and which I liked very much. ‘We Who Are About To…’ is a powerful book. I wish I could say that I loved it. Unfortunately, that wasn’t the case. I couldn’t love the book as much as I hoped to, when I started it. I can’t really fathom the reason why. A significant part of the book was slowgoing. I like slowgoing books but here at places I had to really plough through. The second part of the book is a long monologue by the heroine. Though some readers might be put off by long monologues, I love them. But still overall the book didn’t click for me. It didn’t have the kind of impact that my favourite books have. I was hoping to feel sad or happy or cry or think deeply when the book ended. But none of this happened. However, I am not giving up on Joanna Russ yet. Maybe Joanna Russ grows slowly on you. I have one more book by Russ – ‘The Female Man’ and one more on the way – ‘How to Suppress Women’s Writing’. I hope I will like them more. We always make such distinctions between those of us who are us and those of us who are tables and chairs and then some table turns up and thinks at you, criticizes you, talks to you, looks down on you. Likes you. If Earth had been hit by plague, by fire, by war, by radiation, sterility, a thousand things, you name it, I’d still stand by her; I love her; I would fight every inch of the way there because my whole life is knit to her. And she’d need mourners. To die on a dying Earth. I’d live, if only to weep. One does see, really, in the dark. If you wait long enough. Not real dark, underground dark. But even in a bare night you can see if you wait long enough. Just don’t look directly at things. You can even tell water from non-water. Starving doesn’t drive you mad. But solitude does. Meaning preserves things by isolating them, by taking them beyond themselves, making them transcendent, revealing their real insides by pointing beyond them. 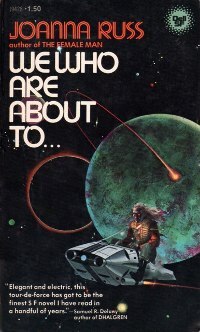 Have you read ‘We Who are About To…’ or any other book by Joanna Russ? What do you think about them? Alexandre Dumas’ ‘The Three Musketeers’ was one of my favourite books during my pre-teens and early teens. I read the abridged edition at that time, and I read it many times. Later when I went to work, I got my first copy of the unabridged version of the book. It was still wonderful, but the magic seemed to have waned a little bit. This month our book club decided to read this book. I was quite excited but also a little worried – excited because I wanted to enter the world of D’Artagnan and his friends and Milady and Cardinal Richelieu again, and worried because I wasn’t sure how my re-reading experience was going to be and whether it will disturb my original pleasant memory of the book. I finished reading it during the weekend. Here is what I think. I think the story told in ‘The Three Musketeers’ must be known by everyone and so I will just summarize it in a few sentences. It is about a young man who travels from his village to Paris in search of fame and fortune. He meets strangers on the way, gets into skirmishes, makes some wonderful friends, ends up being in the king’s service, gets caught in political intrigues and he and his friends weather all storms and beat the baddies at their game. If you want to know more and you haven’t read the book, you should read it soon. It is filled with action and humour and suspense and is a page turner. I loved what Pevear said and when reading the story one realizes that what he says is true. One thing that I discovered during my re-reading was that the characters were more complex than I initially thought. I couldn’t remember much about the minor characters from my earlier readings. But when I read the book again now, I discovered, for example, that the lackeys of our four heroes had interesting personalities of their own. Planchet, D’Artagnan’s lackey, is quite an interesting character, who is brave in important ways but is also wise enough to shy away from confrontation and danger when that is the right thing to do. I also had always pictured that out of the main characters, the good guys were D’Artagnan, the three musketeers Athos, Porthos and Aramis, Monsieur de Tréville, the Queen and Madame Bonacieux while the baddies were Cardinal Richelieu, Rochefort and Milady. Though this simplification is true to a certain extent (for example, Madame Bonacieux is really the angel that she is made out to be), Dumas also makes some of the characters flawed and complex and though we might like them or otherwise, we are able to appreciate that they are more complex human beings. For example, our hero D’Artagnan appears to be noble and brave and helps his friends and his Queen and those on his side. But there is another side to him. Though he is in love with Madame Bonacieux, after her disappearance, he doesn’t really go in search of her. He has got madly attracted to Milady and even after he discovers that she is responsible for Madame Bonacieux’ abduction, he chases Milady. He seduces Milady’s maid Kitty and uses her to get to Milady and after sleeping with her he makes her realize her that he has betrayed her. This is definitely not the behaviour of a noble hero. On the other hand, Milady, who is portrayed as the black-hearted villain, has more to her than meets the eye. When we learn the truth about Milady’s past, we feel sad for her and even sympathize with her. She was a nun who fell in love with a priest. When she tried running away with the priest the law caught up with them and both of them were branded. When she and her lover move to a village and live their life peacefully, the local lord falls in love with her and marries her. Then he discovers that she is branded and ties her up and hangs her. Milady somehow survives all this. And possibly her heart changes after this. And she becomes the cynical villain that she turns out to be. Even then there are some touching scenes where we can feel her heart softening, first towards the Count de Wardes and later towards Lieutenant Felton who saves her and helps her escape when she is imprisoned. Unfortunately, she is so far down the line that she doesn’t have any chance at redemption. But looking at Milady’s story, one feels that she was a strong woman who wanted to be free and the circumstances of her time did not permit her to be that way. I don’t know whether Dumas intended readers to think that way or whether it is my 21st century self reading between the lines and inserting my own interpretation there where none exist. But this is what I think. However, I would give credit to Dumas for one thing. There is a part of the book, where for a straight hundred pages, Dumas describes the story from Milady’s perspective and ignores our hero and his friends. For a hundred pages it is just about Milady and her life and the dangers she faces and how she comes out of them using her strength and determination. I don’t think the villain of a novel has got this much coverage in any book. Definitely not in a classic novel. Dumas must have been a brave man to do that and deserves kudos for that. Nothing makes the time pass or shortens the way like a thought that absorbs in itself all the faculties of the one who is thinking. External existence is then like a sleep of which this thought is the dream. Under its influence, time has no more measure, space has no more distance. You leave one place and arrive at another, that is all. Of the interval in between, nothing more remains in your memory than a vague mist in which a thousand confused images of trees, mountains, and landscapes dissolve. The edition I read had notes which explained many of the historical and cultural references in the story – for example the Bartholomew massacre (on the night of which, Rafael Sabatini’s love story ‘The Scapulary’ takes place, and which I liked very much), the Edict of Nantes, the French wars of religion, the arquebus the first portable firearm, Madame de Sévigné (whose letters I want to read very much), the story of Judith from the Apocrypha, the illustrious family of Montmorency (I didn’t know that the dog Montmorency from Jerome K. Jerome’s ‘Three Men in a Boat’ had an illustrious background), Peter Paul Rubens (one of my favourite painters). The notes section was quite informative and fascinating to read. There were also some quirky odd things in the story which I had fun spotting. For example, on page 65 there is a line which says that Athos had planned to spend the afternoon playing tennis with Porthos and Aramis. I wondered whether tennis was really played in the 17th century (the story narrated in the book happens from 1625 onwards). I did some research in Wikipedia and discovered that lawn tennis (the popular version today) gained popularity only in the 19th century, at the time Dumas wrote this book. The game which was prevalent at the time the story was told was real tennis which was an older version. On page 86 there is a sentence which says that Aramis looked at his watch. It made me wonder whether watches were prevalent in the 17th century, at the time the events of this story happened. Again I took the help of our old friend Wikipedia and discovered that pocket watches with glass covering the face were used from around 1610. Quite interesting! Another thing that I noticed was that when the story starts Dumas tells us that the King has musketeers while the Cardinal has guards, who are the musketeers’ competitors. M. de Tréville tells D’Artagnan that he has to work for two years and needs to have a distinguished service before he can become a musketeer. In due course, D’Artagnan becomes a musketeer. In the last scene of the book, Cardinal Richelieu promotes D’Artagnan from a normal musketeer to a lieutenant. How did the cardinal get the power to promote a musketeer when it was really under the domain of M. de Tréville and the King? It looked to me that Dumas slipped up there. Dumas ties up all the loose ends at the end of the story – the good guys win and the baddies are either defeated or come over to the good side. But I was unhappy about one thing. While through most of the story, Cardinal Richelieu, Rochefort and Milady conspired together, in the end it is Milady who pays the price while the Cardinal and Rochefort get away with it. I wanted to ask Dumas – “If the bad guys are all men, then they can change in the end and get together with the good guys and redeem themselves and everything is hunky dory for everyone, while if the bad person is a woman then she doesn’t have any redemption and she should be executed – is that what you are saying? What kind of sexist ending is that?” I even got a little bit angry when I thought about it. I can’t remember the last time I felt so sympathetic for a villain. I have watched the Gene Kelly movie version of the novel before. I want to watch it again. I also want to watch the other versions – the version where Charlie Sheen plays the role of D’Artagnan (I think he would be perfect for that role) and the more recent one where Christoph Waltz plays the role of Cardinal Richelieu (isn’t he the perfect person to play that role? Has Hollywood found its perfect villain?) I also wonder who plays the role of Milady in these three versions. I can imagine Bette Davis or Barbara Stanwyck playing it in the original version. I have to watch it again to find out. Indeed it is – to the joy of countless generations of readers. That anecdote made me smile. I couldn’t agree more with that sentiment. If you haven’t read Dumas’ ‘The Three Musketeers’, I would encourage you to do that. It is not a slim novel – at 673 pages the edition I read was bigger than the typical novel I read – but it is fun to read and gives hours of reading pleasure. I always knew that ‘The Man in the Iron Mask’ also features our heroes from ‘The Three Musketeers’, but recently while doing some research, I discovered that there are two sequels to ‘The Three Musketeers’ – ‘Twenty Years Later’ and ‘The Vicomte de Bragelonne’. And the chunksterish ‘The Vicomte de Bragelonne’ is itself divided into three volumes – ‘The Vicomte de Bragelonne’, ‘Louise de la Vallière’ and ‘The Man in the Iron Mask’. I hope to read these sequels one day soon and follow the subsequent adventures of D’Artagnan and his friends. 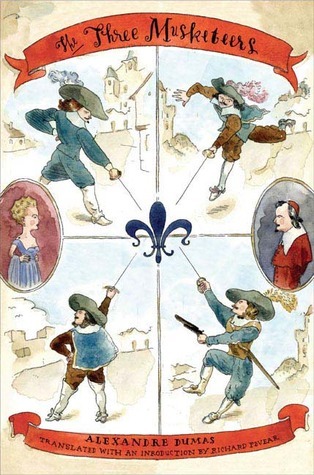 Have you read Alexandre Dumas’ ‘The Three Musketeers’ or seen any of the movie versions? What do you think about it? I discovered ‘Glaciers’ by Alexis Smith through the Caroline’s (from Beauty is a Sleeping Cat) review of it. Something about the book and Caroline’s description of the Tin House edition made me want to read the book. I finished reading it yesterday. Here is what I think. ‘Glaciers’ follows one day in the life of Isabel. Isabel lives in Portland, Oregon. She works in a library and repairs old books. She lives a quiet, contented life. She takes pleasure in the small, simple things – shopping for a nice secondhand dress which is atleast a few decades old, buying an old vintage postcard or photograph, wrapping her hands around a hot cup of tea and sipping her tea slowly, making gentle conversations with office friends, eating lunch alone at a quiet vegetarian restaurant. After a few pages we fall in love with Isabel. Isabel also likes one of her office co-workers, Spoke. He, of course, doesn’t know it, because he seems to be equally introverted like Isabel. They have quiet, brief conversations in the morning at the cafeteria in the office, before others arrive. On this particular day, the story moves between the present and the past – we learn about Isabel’s childhood in Alaska, about what happened to her parents and how she moved to Portland, about her aunt and uncle (the Astrologer and the Carpenter) who treat Isabel and her sister like grownups but who are also kind to them, about the glaciers melting, about how Isabel’s fascination with old photos and postcards (‘ephemera’) started. The present day story continues with Isabel getting ready to go to work, her quiet conversation with Spoke, her accidental lunch with Spoke, her wanting to invite him to a party in the evening. How Isabel’s past and present entwine and whether she is able to declare her love to Spoke and what happens to them, form the rest of the story. She cups her tea in both hands, fingers wrapping around the cup and meeting on the other side. The summer light was fading and there was a lightness in the air, so that voices seemed to float in the window several seconds after they were spoken. The brevity of the postcard – the intense focus on the moment in the park – it was as intimate as a young man could be. Like reaching out and brushing a strand of hair from her eyes. Isabel found herself staring into her box at her belongings, noticing how different they looked, like they had suddenly lost the context of her life. Everything they’ve never said flows into the narrow space between them. She stirs, puts the hot spoon into her mouth, the metal and sweetness burning her tongue. The crows woke her, in the trees outside; they slipped into that place between dreaming and waking. There are treasures everywhere, her father told her. What kind of treasures? she asked. Oh, Isabel said, unsure if this was actually proof. Belly, he said, putting the record down on his stack and squatting next to her, it’s a treasure if you love it. It doesn’t matter how much it costs, or whether anyone else wants it. If you love it, you will treasure it, does that make sense? The book is worth reading for these beautiful images and scenes alone. It also tells the story of a gentle soul. There are interesting literary references in the book – I could spot James Baldwin, Ford Maddox Ford, Elizabeth Hardwick, Samuel Delaney, Virginia Woolf. I am sure that if I looked more closely, there will be more. I don’t know whether this is true, but the book also seems to pay homage to James Joyce with the absence of punctuation marks and the circular nature of the ending. Clearly Alexis Smith is well read and has a sophisticated, fine literary mind. As the story is set in Portland, one of my favourite cities where one of my favourite friends is from, I thought there will be something about the city in the book. Maybe a mention of Laurelhurst pub or the Rose garden or the Portland State University. Unfortunately, there was not much of the city in the book. I remember seeing a mention of the Columbia river gorge though. The Tin House edition of the book that I read is beautifully produced. My favourite parts of the cover were the back cover and the inside flap at the back. When we look at the back cover, it looks like a torn paper is on top of the actual cover. It also looks like the book has got wet at some point – maybe because someone carried it out while it was raining – and those water stains are there on the back cover. I know these stains by experience because some of my books which got wet have stains like this. It took me a while to realize that these stains were not real but they were the magic of the artist. Also, when I looked at the inside back flap, the torn part looked very real and I had to pinch myself and check the picture again to assure myself that it was the artist’s magic. Simple artwork, but very beautiful. ‘Glaciers’ is a wonderful debut novel. I loved it. It is a book that I will keep dipping back into again and again to savour the beautiful, gentle images. I can’t wait to find out what Alexis Smith comes up with next. 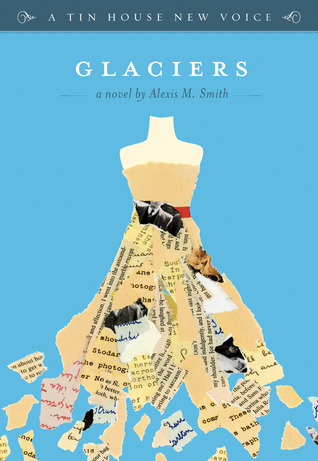 Have you read Alexis Smith’s ‘Glaciers’? What do you think about it? As happens frequently when we discover a new author, we suddenly stumble upon the author’s name in all kinds of unlikely places. I was browsing through Allie Condie’s ‘Matched’ series as I was thinking of reading the second and third parts. In the interview featured in the book, Allie Condie said Anne Tyler was her favourite author and she loved reading anything by Tyler. Then I discovered that Anne Tyler was one of those reclusive authors – she didn’t give interviews, she didn’t go on book tours, she didn’t give talks, she didn’t write essays and book reviews for literary magazines to ensure that readers continue to remember her and she didn’t do the myriad other things that writers are expected to do today. She just wrote books and let her books do the talking. There is something old-fashionably romantic in a reclusive writer and I totally loved her for that. Then I also discovered that ‘Breathing Lessons’ won the Pulitzer prize in 1989. How can one resist the book after all this? I got ‘Breathing Lessons’ and started reading it last week and finished reading it yesterday. Here is what I think. ‘Breathing Lessons’ follows a day in the life of Maggie and her husband Ira. Maggie and Ira have been married for twenty-eight years. Both of them are close to fifty years old. Maggie and Ira have a son, Jesse, and a younger daughter Daisy, who is leaving for college soon. One day Maggie gets a call from her best friend Serena. Serene says that her husband recently passed away and the memorial service is going to be held the next day, which is a Saturday. Maggie convinces Ira to come with her the next day morning and they plan to drive to Serena’s place, which is a long drive away. During the long drive, Maggie thinks about her pas and about her son Jesse. Maggie’s son Jesse is divorced from his wife Fiona. Jesse was an aspiring musician when he met Fiona and both of them were teenagers then and very much in love. One day Fiona gets pregnant and tries to have an abortion. But Jesse tries to convince her to have the child. Maggie helps out Jesse by doing her part in convincing Fiona. Due to Maggie’s intervention, Jesse and Fiona get married, eventhough they are still teenagers. But, over time, things don’t work out well for them – they end up having misunderstandings and fights, sometimes because of the involvement of Maggie and others, and at some point they part company and get divorced. Maggie wants them to get back together, because she believes that both of them are still in love with each other. So she tries to convince Ira that during their ride back after the memorial service, they should stop by at Fiona’s place. During the memorial services, Maggie meets many of her school classmates. And it looks like Serena has planned an unusual memorial service which astonishes most of her friends. What happens then and what happens later when Maggie and Ira go to Fiona’s place form the rest of the story. So the world was not as Ira had perceived it, evidently. It was more the way Maggie perceived it. She was the one who got along in it better, collecting strays who stuck to her like lint and falling into heart-to-heart talks with total strangers. Maggie’s children, Jesse and Daisy, are interesting characters too, and so is Jesse’s former wife Fiona and Maggie’s friend Serena. There is a character called Mr.Otis, whom Maggie and Ira pick up from the highway during their drive, and he is quite interesting too. The story doesn’t end in the way that one might expect, but the ending is perfect. It is complex and messy like life is, and we leave Maggie plotting one more scheme to meddle in other people’s lives to make them happy. Now, something on the large-print feature of the novel. In these days of the Kindle and the iPad, the type and size of the font doesn’t matter, because we can change that to what we want. But during old times font sizes did matter because the bigger the font size the thicker the book and the more number of pages it had which would result in the increase in the cost of production of the book. So books which had more words had smaller font sizes and books with lesser number of words had bigger font sizes. But most books had a standard font size. I have discovered across the years – and I don’t know whether this is how my mind got conditioned or whether all readers feel the same way – that there is an optimal font size which made my reading experience intense. If the size of the font was larger than this, then it made me relax and read the book in a less intense way. I don’t know what was the exact font size at which this happened, but when I look at a font size, I can tell whether it is going to be an intense read or a relaxed read. The edition of ‘Breathing Lessons’ I read had a font size which would make it a relaxed read. (The only other books with this kind of huge font sizes that I have read were abridged versions of classics published by Baronet Books, which had an illustration on one page and text on the next.) But it was also a work of literary fiction and a Pulitzer Prize winner at that, and so I was interested in finding out how my reading experience would be. Well, I have to say that my reading experience was pleasant and relaxed and I was also able to read faster, because of the big font size. But I was also able to appreciate the beautiful passages and scenes that Anne Tyler wrote and re-read many of my favourite passages after I finished the book. I think it was fun reading a literary fiction book in big size font. I would like to try it again. ‘Breathing Lessons’ is a charming, lovable novel. It is sad and humorous at the same time. I think it is what one would call a traditional American novel, with focus on the plot with lots of dialogue, depicting everyday life with believable characters and beautifully described scenes. The characters in it feel real and sometimes we are able to see echoes of real people we know in the story. I liked everything about it starting from the fact that it depicts the events of one day (like the ancient Greek playwrights used to do), the charming character of Maggie and her meddling and loving ways and the perfect ending. I can’t wait to read more of Anne Tyler’s works. I will leave you with a link to Emma’s (from Book Around the Corner) beautiful review of the book and some of my favourite passages from the book. Men just generated wires and cords and electrical tape everywhere they went, somehow. They might not even be aware of it. They entered Pennsylvania and the road grew smooth for a few hundred yards, like a good intention, before settling back to the same old scabby, stippled surface. Why did popular songs always focus on romantic love? Why this preoccupation with first meetings, sad partings, honeyed kisses, heartbreak, when life was also full of children’s births and trips to the shore and longtime jokes with friends? Once Maggie had seen on TV where archaeologists had just unearthed a fragment of music from who knows how many centuries B.C., and it was a boy’s lament for a girl who didn’t love him back. Then besides the songs there were the magazine stories and the novels and the movies, even the hair-spray ads and the pantyhose ads. It struck Maggie as disproportionate. Misleading, in fact. …she had taken real joy in rounding out a note just right, like a pearl or a piece of fruit that hung in the air a moment before it fell away. When they stepped out of the church it was like stepping out of a daytime movie – that sudden shock of sunshine and bird-song and ordinary life that had been going on without them. I mean you’re given all these lessons for the unimportant things – piano-playing, typing. You’re given years and years of lessons in how to balance equations, which Lord knows you will never have to do in normal life. But how about parenthood? Or marriage, either, come to think of it. Before you can drive a car you need a state-approved course of instruction, but driving a car is nothing, nothing, compared to living day in and day out with a husband and raising up a new human being. 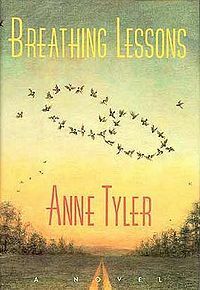 Have you read Anne Tyler’s ‘Breathing Lessons’? What do you think about it?